When you see sideways price action, what goes on in your mind? Is it danger, opportunity, or a blank? Don’t let it be a blank. Put every congestion pattern to good use with these 3 practical uses of price congestion. Stop giving a useless label to sideways price action. Instead, use them to improve your price action reading skills. These rectangles on your charts might just be the boost you need for achieving your trading goals. Most traders look for support and resistance based on swing pivots. Some traders use pivot point formula and Fibonacci projections for the same purpose. These are great methods, but don’t overlook congestion areas. They project solid support and resistance zones that are highly reliable. Towards the end of the trading session, price congested. The first half an hour of the next session found buyers around the area of that Congestion Zone. Note the long lower tails of the price bars. They hinted at the supportive strength of the congestion from the last session. Indeed, in the next session, the early morning price fall was halted by this support zone. 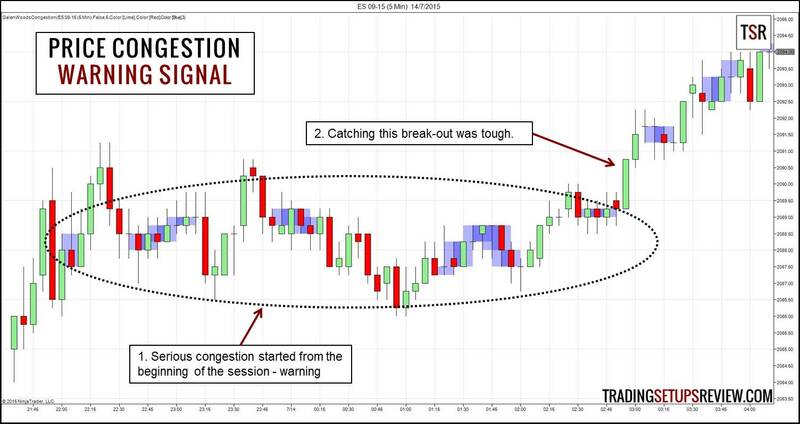 Let’s rewind a little back to the Congestion Zone found in the middle of the second session. We projected a potential support and resistance zone with it as well. The next session opened near the zone, which acted as a support area which failed quickly. However, the zone made a clear show of its power as resistance. 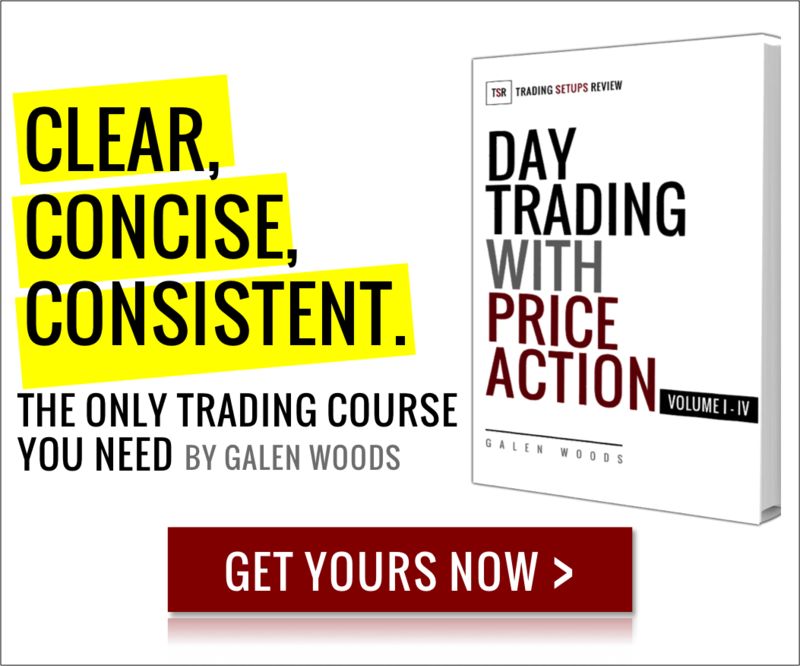 This method relates to the idea of using high volume formations as support and resistance. As a market moves sideways, trading volume is concentrated within a price band. This high volume price band then forms a potential support or resistance zone. Most trends do not reverse sharply. They tend to drift sideways before resuming or reversing. If you’ve managed to join a trend and secured a paper profit, use signs of price congestion to take your profit. You can get out with a nice real profit before the trend resumes or reverses. 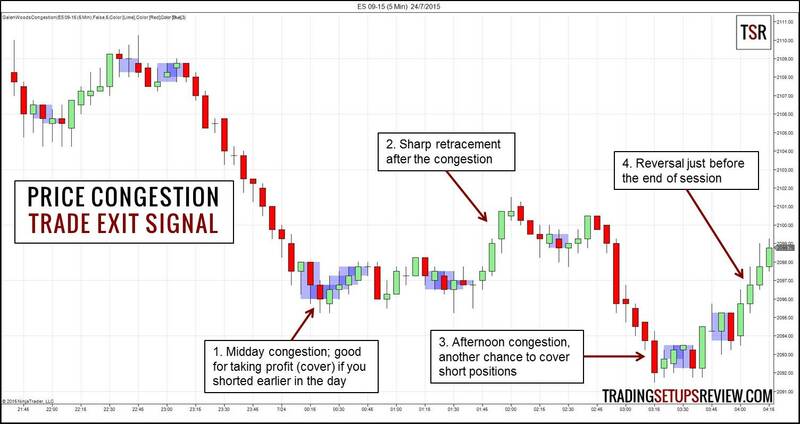 Day traders can combine congestion patterns with the time of the day for effective exits. Congestion signals at midday and towards the end of the session make a strong case for immediate exit. Look at the day trading example below. It shows an entire ES trading session. The sideways action here pushed the market into uncertainty. If you were short, it was a good place to cover. Bears who covered upon the midday price congestion would have avoided this adverse movement. The afternoon congestion gave another chance for bears to take profit. If not, they would give some profit back to the market as it reverses up towards the end of the session. When the market congests for a prolonged period, it is a warning. It cautions you that the profit potential of your trade is limited. That is true at least until the market breaks out from the congestion. It is best not to risk your precious trading capital when profit potential is limited. Trying to anticipate the eventual break-out is reasonable, but expect multiple failed break-outs. Staying out is the best policy. It is always wise to stay out of prolonged sideways action like the one in the chart above. You might have this question in your mind. 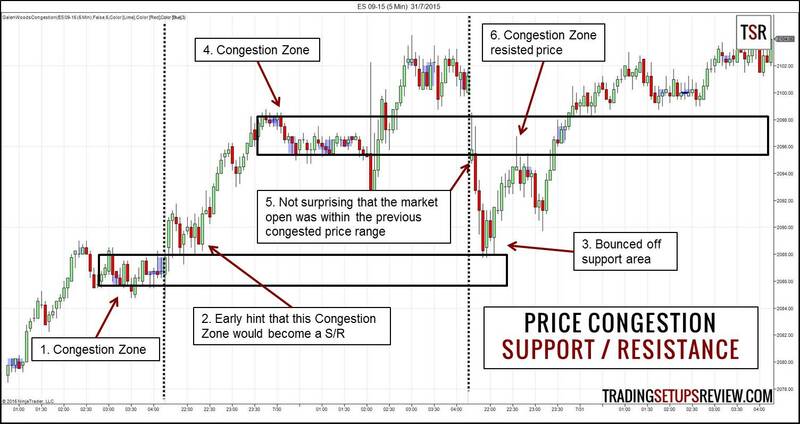 In the examples above, I used the Congestion Zone taught in my Day Trading with Price Action Course. It’s a simple price action pattern that takes at least three bars to form. The blue areas on the chart are marked out according to the definition in the course. But remember that price congestion is a concept, and not a rigid pattern. It refers to sideways price action. Hence, you can use any definition of price congestion. You will still find the same useful characteristics discussed above. Now, open up your charts and start finding value in sideways price action.